February 29, 2012 marked the 5th international Rare Disease Day. Hundreds of patient organizations from more than 40 countries worldwide converged around the slogan “Rare but Strong Together” to strengthen one voice of patients to: (1) give hope and information to patients, (2) bring stakeholders closer together, (3) coordinate policy actions in different countries, and (4) get equity in access to care and treatment (source: www.rarediseaseday.org). It isn’t that rare to be rare. According to the Canadian Organization for Rare Disorders (CORD) 1 in 12 Canadians have a rare disorder. RareDiseaseDay.org reports that there are between 6,000 and 8,000 existing rare disorders. The definition of a rare disorder varies by country. In Europe a disorder is called rare when it afflicts less than 1 in 2,000 people. In the USA a disorder is rare when it afflicts fewer than 200,000 Americans at any given time. encouraging research where the patient population size would not support specialized research under standard business conditions that rely on large patient populations. establishing a reasonable approval process for new therapies since large randomized studies cannot be completed because there simply aren’t enough patients. obtaining a national funding commitment to provide access to treatments by reducing costs for pharmaceutical companies to supply treatments and subsidizing drugs. These drugs may mitigate irreversible complications or relapse that currently cost the healthcare system. "It is vital we raise awareness of this important rare disease issue in Canada with both policymakers and the general population. We further ask that our government to continue to explore ways to support this NOT so rare segment of Canadian population as it seeks equality in the eyes of our healthcare system." – Simon Ibell, Be Fair 2 Rare™ campaign chair. In addition to supporting CORD and BE FAIR 2 RARE™ activities to mark Rare Disease Day 2012, Answering TTP Foundation engaged patients and supporters to raise awareness for TTP and the need for blood donation via the 1st Rare Disease Day TTP Blood drive. This initiative has grown our international base of blood donors, donating in honour of TTP, to 63 active members! Congratulations to all donors. A special thanks also to those who may not have been able to participate themselves, but rallied their personal networks to donate. More blood donors donating toward this program translates to more blood available for all in need, and more life-saving awareness for Thrombotic Thrombocytopenic Purpura (TTP). For more information about our ongoing blood drive click here. 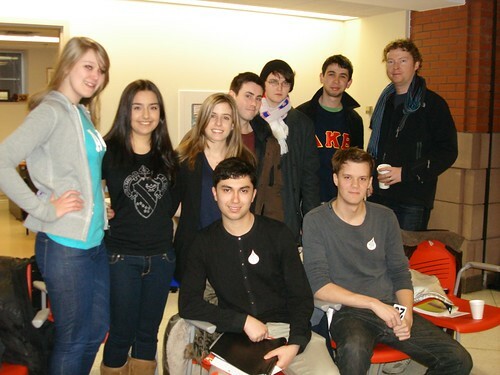 University of Toronto Students from Delta Kappa Epsilon and Alpha Phi roll up their sleeves in support of Answering TTP Foundation's Rare Disease Day TTP Blood Drive.